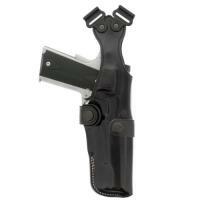 Galco Vertical Shoulder VHS Holster Component (Black) FREE SHIPPING! The Vertical Shoulder VHS Holster Component from Galco is an ambidextrous, vertical carry holster designed for use with Galco shoulder harnesses. It does not require a holster-side tie-down, and is not compatible with them. Originally designed with input from law enforcement helicopter pilots, it can be worn overtly over a flight suit without exposing a horizontal muzzle, and also fits outside a BDU or hunting gear. While built for exposed carry, its low-profile design also makes it an excellent concealed carry option. The holster is made from premium saddle leather, making it extremely tough but also soft enough to avoid damaging your firearm's finish. ©2002-2019 CopsPlus.com: Galco Vertical Shoulder VHS Holster Component (Black) FREE SHIPPING!